Fine lines and industrial form make the Avalon Gooseneck Barn Light a great addition to rooms and other sorts of spaces where you’re looking to integrate a vintage flair. The Avalon would work particularly well over table settings in cafés to provide task lighting or install a pair outside your front door for some old world homeliness. 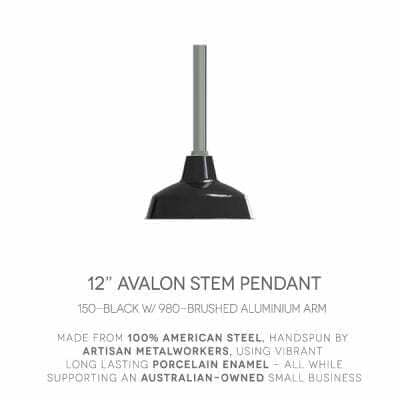 The Avalon is crafted from American steel and coated in tough porcelain enamel so it can withstand all manner of outdoor elements. 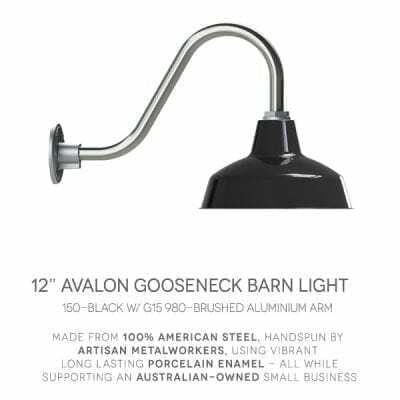 Indoors or out, the Avalon Gooseneck Barn Light is a high quality light source with classic style and long-lasting utility. There are a few important things to keep in mind when returning a product you purchased. You can return unwanted & unused items by post within ninety (90) calendar days of receipt of your goods. You have thirty (30) calendar days to return an item from the date you received it. Only items that have been purchased directly from us (and not resellers) are eligible for discounts. 1) Phone (03) 8743 5500 OR email us (sales@barnlight.com.au) to request a return. Please ensure your package as we are not liable if the product is damaged in transit. This sleek barn light fixture provides plenty of light as a kitchen island pendant or office pendant light. Its modern warehouse shade is hand crafted to last! Can I use my Barn Lights outdoors? The Old Dixie Gooseneck Barn Light by Yvonne J.